But inside the Capitol building, where things are a little easier to control (where the crowd was 5,000 instead of 50,000 or more), there was an incredible effort made to moderate language by everyone in possession of a bullhorn. Any time a chant of “Kill the Bill!” started up, organizers would shout “STOP the Bill” and within a couple of rounds, everyone would be switched over. Despite the constant rotation of protesters inside the Capitol, people seemed to catch on pretty quickly. Around noon, as the voices of the organizers gave out, they began encouraging others to give brief testimonials. Even here, there was a gentle moderation of folks’ language. One woman spoke passionately about having fought for the right to collectively bargain using a fair bit of violent imagery. When the organizer took back the bullhorn, he affirmed her sentiments while reminding everyone that the right to collective bargaining was won by “raising our voices together” and not by any physical violence. In fact, the reminders that “This is a peaceful protest” and to “Stay calm and protest on” were everywhere: on people’s signs, taped to the wall, and on fliers being handed out as you entered the area explaining in detail what to do if someone tried to provoke you. I have no doubt that the careful attention to language is, at least in part, in response to the shooting in Tucson last month. I’d like to think they mark a permanent step forward in acknowledging that words matter and that it is our responsibility to ensure that everyone who hears our message knows exactly what we do and don’t mean. Jonas and I spent our Saturday in Madison to lend our voices to the movement against Governor Scott Walker’s attempt to destroy Wisconsin public-employee unions. We both found the experience empowering and inspiring; here are a few scattered thoughts I find worth sharing. First: this movement is not marginal. Much of my experience with social movements comes from the so-called “anti-globalization” movement that peaked in the United States in 1999-2001, and from the anti-war movement that began building after 9/11. Both of those movements involved mass protests that combined “regular” middle- and working-class folks with privileged young activists, fringe lefties, black bloc anarchists, and a smattering of incomprehensible crazies. Without doubt, the “regular” folks and young activists were the vast majorities, but their voices were too often drowned out by the rest, particularly at large protest events. This one is different. This protest features all your typical assortment of working-class families you might find at a labor rally, plus tons of teachers, their families, and their students; university student activists; and mainstream Wisconsin Democrats. 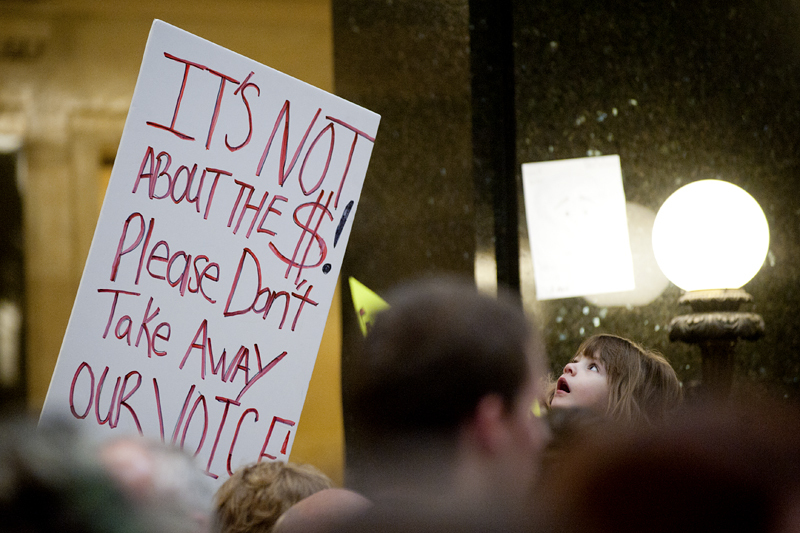 On Saturday, there was some inevitable message creep, but by and large, the speakers, signs, and discourse was all right on message: decrying Walker’s bill as an attack on essential workers’ rights. Third, the messaging is well-controlled. There was only one sign Jonas and I saw that hinted at the potentially damaging effects of guild-unionism (or occupational licensing), something along the lines of, “I’m not replaceable, I’m a professional.” This raises some troubling rifts between skilled and unskilled workers, differentiating professional work as somehow more worthy of protection compared to less-skilled work. This, of course, is the modus operandi of the structure of the global economy, which places low-wage unskilled work at the mercies of global competition while developing new structures to protect those in high-wage skilled work. That one sign aside, for the most part, all the words and speeches emphasized the importance of unions as a source of power for working people as a whole – not as a source of power for some segments of the workers to use against other segments of the same. Also, there was a very useful emphasis on the fact that unions are important not just for wage bargaining, but also as a source of worker voice: “Take my money, but don’t take my voice” was one of my favorite signs. Fourth, and least consequential, the Wisconsin Capitol is incredibly accessible. We had some inkling of this when we visited the Capitol building last year, but we were still surprised by the fact that throngs of protesters were freely let into the building without any kind of security checks, and allowed to congregate in the middle of the rotunda, chanting and singing and screaming and beating drums and playing brass instruments and plastering signs all over the walls (albeit only using painter’s tape). The treatment of this building as a truly public space was inspirational, particularly given my only other experience with government buildings – at the federal level in D.C., where things are handled rather differently to say the least. This is certainly not to imply that the federal government should treat its buildings the way Wisconsin treats its Capitol; but nevertheless, the contrast was incredibly stark. Some more of my photos from both inside the Capitol and outside are after the jump. The rallies outside were larger by orders of magnitude than the occupation inside (I’ve seen estimates of 60,000 outside versus a few thousand inside), but most of my photos are from the inside event, as those are what we tended to find most inspirational. Click on any photo to view a larger version. For some excellent video of the protests over the past six days, check out Matt Wisniewski’s work – five minutes of impeccably filmed and edited footage from Feb. 15-17, and five more from Feb. 18-19. “For anyone interested in union rights, the fight in Wisconsin couldn’t be more important,” says Harvard’s Benjamin Sachs, as quoted in the New York Times. I know that not all readers of this blog are necessarily keeping up with the latest in labor news, and I feel this particular piece of labor news is crucially important. So a summary follows: not something we normally do here (we’re generally more predisposed towards analysis), but in this case, perhaps necessary. 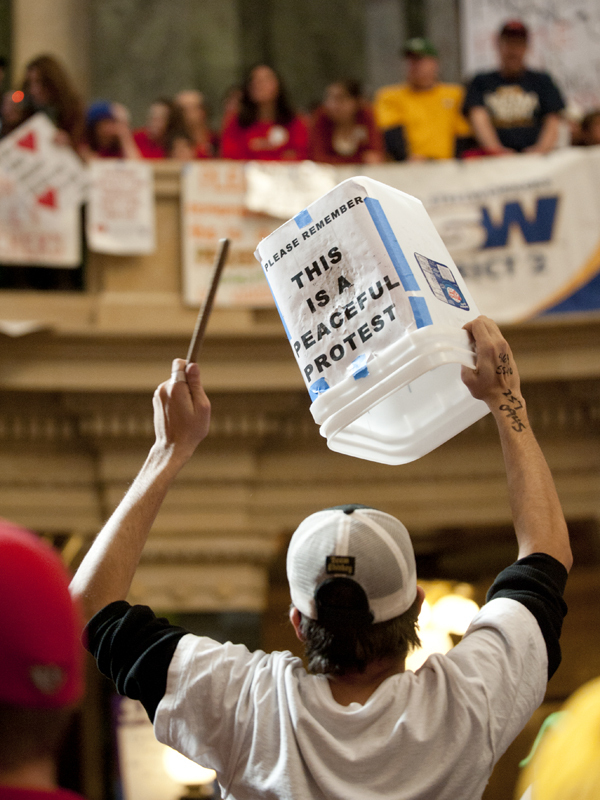 While the world’s attention is rightfully focused on the Middle East and, to a lesser extent, the budget battle in D.C., the contentious showdown in Madison, Wisconsin over public employees’ unions deserves no small chunk of our time and energy. Wisconsin governor Scott Walker is pushing a bill that would effectively strip public employees (except, in a naked political move, police and fire workers, who tended to support Walker’s bid for governorship) of their rights to collectively bargain, would make it much more difficult for public-employee unions to collect dues, and would require an annual vote just to keep a public-employee union in existence. Of course, this is being sold under the rhetoric that excessive public-employee compensation is at the root of state and local fiscal problems (not, you know, a worldwide economic crisis caused by out-of-control Wall Street bankers who, incidentally, are at very little risk of losing their jobs and benefits). This is a thinly veiled attempt at union-busting, pure and simple; Wisconsin’s budget problems are a sideshow. Luckily, Wisconsin’s Democratic senators did a rare thing for Democrats in recent years; that is to say, they found their spines. The Republicans need 20 members present in the Senate for a quorum; without the Democrats, they have 19. The Democrats, knowing this, refused to show up to the Capitol, and ultimately fled the state after Walker asked the police to find them. In the meantime, thousands of workers, families, and other supporters have flooded the Capitol every day since Wednesdays to protest the bill. Whether this gaming of the system on the part of the Democrats is justifiable is a relevant question. I, and many others, would argue that the Wisconsin fight is of huge importance for public-sector unions around the country, and by extension, for all of organized labor. If such an audacious attempt at destroying the institution of collective bargaining succeeds, the consequences will be enormous. If it fails in the face of massive popular protest and principled Democratic resistance, any subsequent attempts to undermine public-sector unions in the name of budget cuts will almost certainly be more moderated. 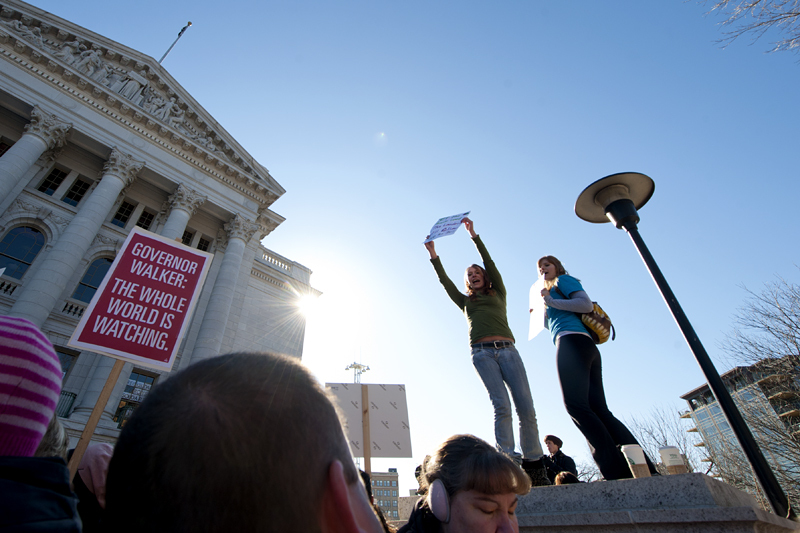 It is crucially important to be clear about one thing, addressed by the sign pictured above: it is not that public-sector employees in Wisconsin are refusing to take pay cuts and are raising hell because they are selfish and greedy. On the contrary, such employees are already living through pay cuts and furloughs. They’re raising hell not because Walker is attempting to take money from them; they’re raising hell because Walker is attempting to take their right to organize and bargain collectively from them. And the rest of us should be raising hell about that too.